Cool Commercial Roofing Systems are constructed of materials that reflect the energy and heat from the sun away from the surface of the roof. The materials for buildings with low-slope roofs are usually bright white in color, but, there are now other colors that are being produced for sloped roof applications. 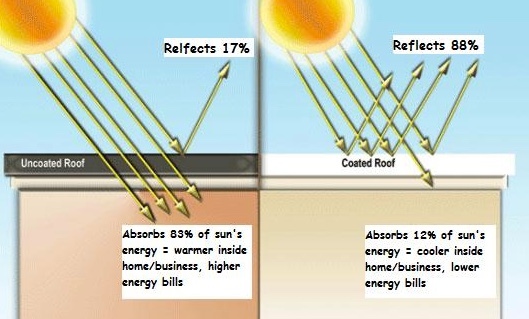 Cool roofing needs to be highly emissive, allowing it to emit infrared energy off the roof. On the other hand, bare metals and metallic coatings applied to them usually have low emissive abilities, which is one of the reasons they’re not considered cool materials. The premise for cool roofing is essentially the same as the reasons that people living in hot climates wear light-colored or white clothing to help keep cool. Light colors reflect heat and sunlight, opposed to dark colors, which absorb them. Commercial properties are similar to people. If your commercial roof is dark colored, your property will be hotter than if it had a light-colored roof. During the hot summer months, a darker colored roof can reach temperatures as high as 150 to 190 degrees at their peak, while cool roofing systems will peak at 100 to 120 degrees. Cool roofing systems have the ability to reduce the temperature on the surface of the roof by as much as 100 degrees, which reduces the heat thats transferred into the dwelling below. This keeps the space and ductwork under the roof cooler, lowering energy expenses, improving comfort for employees and customers, lowering maintenance costs, increasing the lifespan of your roof, and lowering the urban heat island affect and associated smog levels. Reduce roofing waste materials in landfills. Reduce infrared conversion from visible light, making your interior more comfortable. Lower annual electricity expenses by reducing summer cooling costs. Lower air pollution and smog in urban areas. Lower maintenance and replacement costs by extending roof life. Lower the highly publicized heat island effect in urban areas. If you have time-of-use metering you can save on peak time usage. Materials for low-slope roofing systems on commercial and industrial buildings, can be categorized in two ways – single-ply materials and reflective coatings. Single-ply materials consist of large sheets of pre-constructed roofing mechanically fastened together over the old roof and sealed at the seam locations. Reflective coatings are installed or applied using rollers, sprayers, or brushes, over an existing clean, leak-free roof surface. There are other materials for sloped roofs, usually on residential properties, but some commercial buildings, currently available in clay or concrete tiles. These materials stay cool by using special pigments that reflect the sun’s infrared heat. Asphalt shingles or pre-coated metal roofing materials aren’t available in cool versions yet. You can visit the ENERGY STAR® Website for a comprehensive list of cool roofing system products and manufacturers at www.energystar.gov. Initial material costs for cool roofing systems are comparable to traditional roofing materials – some cool roofing products cost less than traditional materials, some cost more. 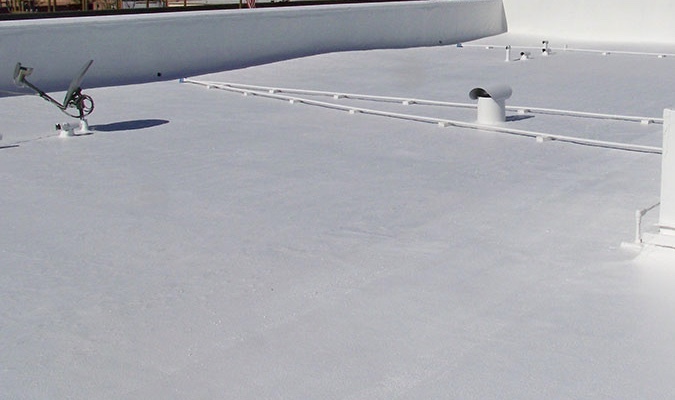 Cool protective coatings can be reapplied periodically every 10 to 15 years, reducing, if not completely eliminating, the need for costly roof tear-offs and replacements. If you add these roof maintenance savings with an average 20 percent savings on cooling costs, it makes cool roofing systems a money saver over the life of your building. There are also rebates available, in addition to energy and lifespan savings, from various local utility companies for utilizing cool roofing on your property. 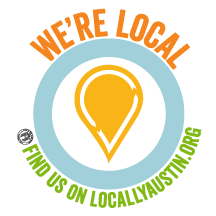 Armadillo Roofing & Exteriors (512) 333-7663, provides commercial services to Austin, Texas and the surrounding area. This includes commercial roof repair, commercial roof installation and commercial roof replacement. We have been providing professional commercial roofing services to the area for over 15 years. If you would like more information about the possibility of a Cool Roofing System for your property, give us a call.